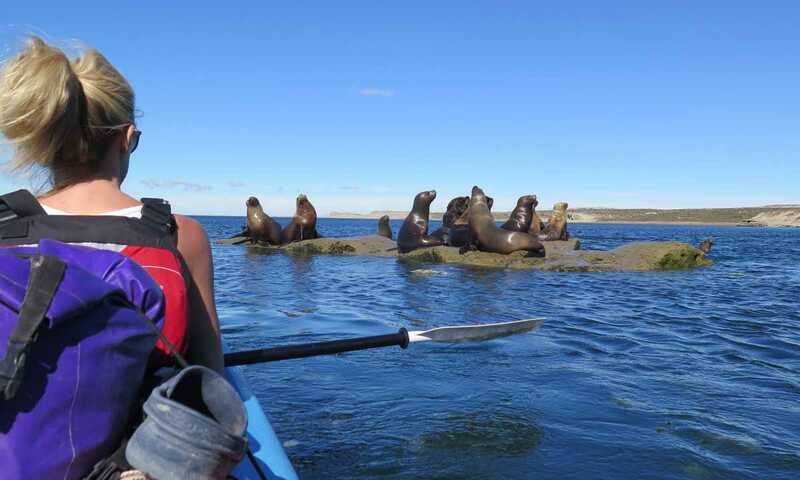 Kayak among the world's largest population of southern right whales, as well as sea lions, penguins, elephant seals and numerous sea birds. Get up close and personal with wildlife whilst appreciating the vast steppe, steep cliffs and magical sunsets from a different perspective. Camp out under starry skies, or have a taster day trip. Grab a paddle, crunch down the beach and push off into the ocean for a day exploring on the water. The beauty of a one day trip is that you'll go straight to the action, your expert guides know the best places to find sea lions and whales, and you'll spend the day gently cruising through the water in the company of the wildlife. Combine a day's kayaking with a whale-watching boat trip, a half day snorkelling with sea lions, or a trip to see a penguin colony. With very few villages lining its shores, it's not hard to find yourself blissfully out of sight of any other people. Taking a few days to paddle around the peninsula means getting off-the-beaten-track, to arrive at secret coves and beaches, and give yourself an even better chance of varied wildlife sightings. This is adventure travel at its best - drawing your kayak onto a secluded beach in the evening, setting up camp in time to watch the sunset glow over the shape of whales in the water. You can be lulled to sleep by the sound of the waves lapping, and whales blowing spray just out to sea.